Adult Leaders, use this form when one of your Scouts recruits a friend to join Scouting. We will send you the FREE patches by USMAIL or you can pick them up at the monthly roundtable meeting. One of the best ways to recruit new Cub Scouts is ‘peer-to-peer’. When a Scout brings a friend to a scouting event (e.g., pack or den meeting, pinewood derby, field trip, etc), they both have fun! It’s a fantastic introduction to Cub Scouts for boys, girls, and their parents. 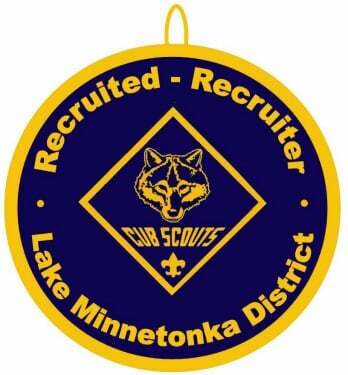 Scouts – if you bring a non-Scout friend to a scouting event and he or she joins scouting, you receive a FREE Recruited-Recruiter patch AND your friend also receives a FREE Recruited-Recruiter patch.